Everyone can bike tour. I’m not kidding, everyone can do it. There are thousands of us all around the world at this very moment and we come from all walks of life. We are young solo females and families with three children who tour for two weeks, or sometimes ten years. We are students, retired couples, newlyweds, professional cyclists, and overweight couch potatoes. We are adventurists, travelers, writers, ski-bums, teachers, lawyers, and paramedics. The only thing we all have in common is our desire to see the world, be it right outside our door in our own backyard or across the world as we pedal through various continents. 1) Buy a bike, any type of bike will do. Obviously there are specialized “touring bikes” (which have a steel frame, like my Surly Long Haul Trucker), but in reality, the only reason you would invest in one of these right off the bat is if you knew you want to go around the world (which I highly recommend!). If not, for weekend excursions or even multi-month long trips, you can make any bike work. Heck, in India I met a Spanish guy who had cycled from Spain (over 15,000km) on a twenty-five dollar used bicycle which he had bought ten years before, and he couldn’t have been happier. If he isn’t proof that any bike will work, I don’t know what is. 2) Pick a direction. Notice I didn’t say destination, because as you will see, cycling isn’t about the destination but rather about the journey. It’s about the beautiful camping in the middle of nowhere. It’s about the farmers who take you in when you get lost, and the wonderful little towns you pass through on your way there. Sure, getting to your destination always gives you a sense of accomplishment, but it’s the moments in-between which will stay with you forever. Plus, cycle tourists are notorious for changing their routes constantly. Take me for example, I started heading East from India in order to make it to New Zealand, but once I got to Nepal I decided I instead wanted to head West to Morocco so I turned around and started to cycle West. And then when I got to Turkey, Kevin and I decided that we actually wanted to cycle through South America, so we bought a flight out to Ushuaia that very same night. That’s the beauty of cycle touring, you are allowed to change your plans whenever you please. 3) Now go. I’m not kidding, just go. It’s as simple as that. You will figure out what foods work best for you once you hit the road, just as you will figure out how amazing people are once you experience your first homestay with a stranger. Cycle touring is one of those things which you just can’t plan, because any plan you make is sure to change a hundred times over, so go out with a sense of openness and adventure, ready to wake up in a new place everyday, and I promise you that everything will work out. There is no need for physical training either, just begin slowly and you will naturally build up your stamina along the way. Did you know the first time I ever road my fully loaded bike was on the first day of this journey? The hardest part is taking that first step out of the door to leave, once you have left, the rest comes naturally. Go out and try it. If you don’t have bike bags, don’t worry about it, just strap your backpack or a duffle bag to the back of your bike and head off for the weekend straight from your front door. You don’t need to fly halfway around to enjoy this lifestyle, in fact, some of the best places to explore may very well be in your very own backyard! Click here to read about more details into this lifestyle, from why it’s not dangerous or scary, to where we get water! Tegan, an absolutely wonderful gal about to cycle through Africa (who has the most hilarious cartoon blog about her trip through Europe which is sure to leave you in stitches), made this wonderful cartoon for an adventure magazine which really leave you no choice but to pack up your bike and leave. Don’t listen to the voices in your head (or the voices of those around you) telling you that you can’t do it, because it’s only impossible to those who have never tried. For a photo of the day and other updates follow me on facebook here, and for some awkwardly cropped photos from our journey, follow us on Instagram @awanderingphoto! 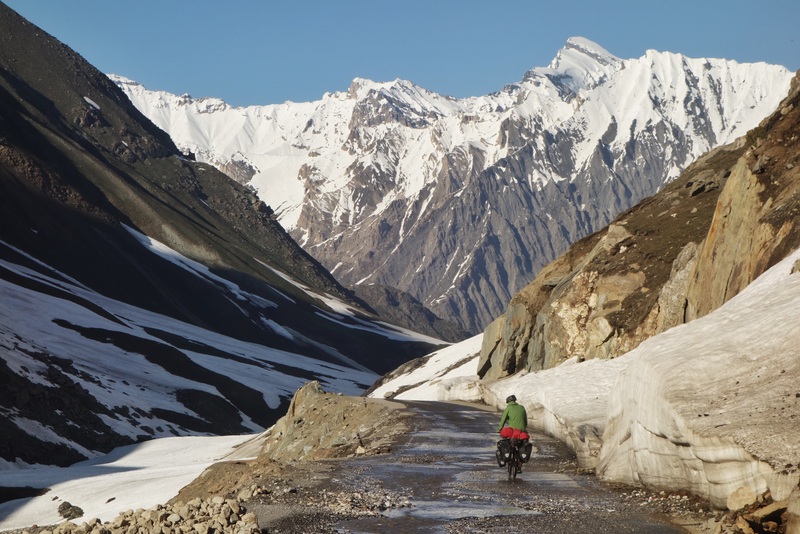 This entry was posted in Argentina and tagged bike touring 101, cycle around the world, help bike touring, how to bike tour, how to cycle tour, how to get started cycle touring, I want to bike tour, learn to bike tour, who bikes tours, why bike tour by The Wandering Nomads. Bookmark the permalink. This is awesome advice. I’ve been preparing to start touring now for 2 years. I think that as soon as the snow melts, I will turn my daily bike commutes into weekend trips and see where that leads me. Thank you for the wakeup call! That’s great! Weekend trips are the best way to gain confidence and have fun as well! Once you start there is no going back, it really gets addicting! Yes! That’s the spirit, weekend trips are great, and really easy to do! That’s great to hear! It’s addicting once you start. Thank you, this is so great, when I am done with sailing I will go back to bikes, where everything started. truly descriptive post and the idea was great. You have inspired me! your photos, your stories, the way you’ve embraced life… I’ve shared your blog with my children and told them “this is what living looks like!” I’m now planning on doing some living for myself. Thank you so so much.